Plunging towards a fiery death: Own this gorgeous Doctor Who art print! 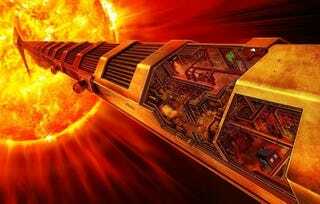 The spaceship Pentallion races towards the sun, in this gorgeous painting of a scene from the Doctor Who episode "42." A signed print of this artwork is up for auction, with the benefits going to young heart-transplant patients.